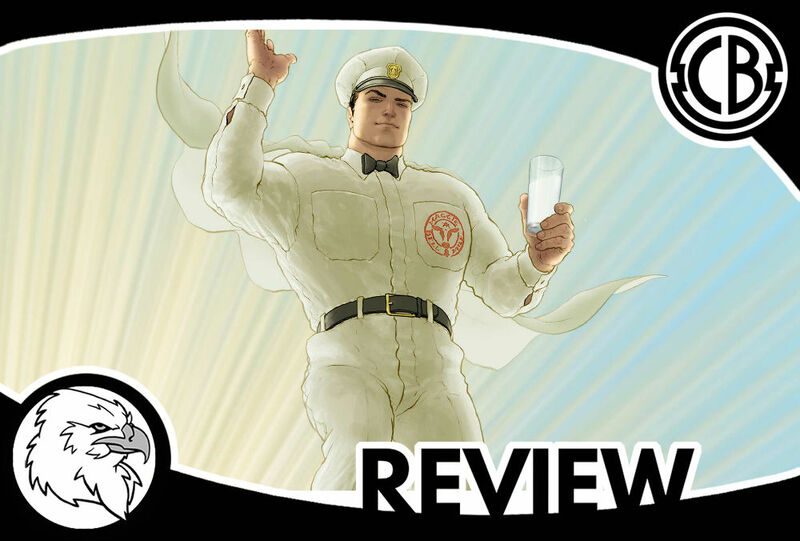 Justice League/ Doom Patrol #1 is the first chapter of the Milk Wars event; an event promised to be the “weirdest” thing that has ever happened to the DC universe. If you were a fan of My Chemical Romance in the early 2000’s, you now have something else to thank Gerard Way for. I’ve read interviews with Way over and over trying to piece together how it is that a rockstar walked into the DC office and said “hey, can I do whatever I want?” and was pretty much told “sure, go nuts.” I’ve decided I don’t care how it happened, I’m just extremely grateful that it did. This is something Way has said he’s wanted to do his whole life- becoming a rockstar was getting sidetracked. I don’t know what god you have to pray to for ‘rockstar’ to be the job you fall into while you’re working towards your dreams, but take me to that church. Milk Wars is an event that ties the characters from Way’s DC imprint, Young Animals, to the main Earth Prime characters. This means that the holy trinity of DC is now interacting with The Doom Patrol, Mother Panic, Cave Carson, and Shade the Changing Girl (oh, and Swamp Thing has managed to get himself caught up in this mess as well). The Justice League is up against a new kind of evil, one that a group of strange and unknown heroes may be better suited to face. The JLA is certainly no stranger to otherworldly interference or mind control, but the sheer oddity of the way this new evil operates drifts the fate of the world into another wheelhouse- the one where Doom Patrol, Shade, and the other Young Animals characters operate. So who is this freakish new villain? A group of reality salesmen called Retconn. When I say ‘reality salesmen’ I don’t mean real estate agents (although they have similarities). This company literally sells reality to buyers by brainwashing and changing those who exist in it to fit the “marketable” specifications of their customers. Earth Prime, where the main JLA exists, is in the process of being sold to a villain called Lord Magna Khan. Now, this is where things start getting weird. Retconn brainwashes the people of a reality to make them suitable for sale by using milk- Maggie Bell Milk. For Earth Prime, this means creating a society of perpetually happy 1950’s nuclear families policed and controlled by terrifying versions of the heroes we know. This Batman is a priest. This Wonder Woman is a Wonder Wife. This Superman is a Milk Man. The Young Animals heroes are pushed to center stage when confronted with these super freaks. After all, who better to ‘wake up’ society than a bunch of angsty teenage outcasts. (Sidenote: The Batman/ Mother Panic portion of this event makes everything worth it on its own by pointing out that Batman, in a lot of ways, behaves exactly like a brooding teenager.) At one point in JLA/Doom Patrol #1, the twisted version of Vixen says “We won’t have you and your creative hair colors disturbing our neighbors.” I can’t prove it, but I’m pretty sure Gerard Way shed a tear after writing that line. Justice League of America/ Doom Patrol #1 takes us through a strange and visually exciting battle for the soul of a small Rhode Island town. At the battle’s conclusion, the awakened members of the JLA and the Doom Patrol members have a hilarious and uncharacteristically sweet moment of empathy. In an almost nihilistic celebration, they agree that none of their lives make any sense. Reality, the way they are used to it or otherwise, makes no sense. If you’ve ever stayed too late at a theater kid house party, you’ve probably witnessed this exact moment. Of course, the real fight is far from over. Retconn are salesmen- they have no intention of letting this sale fall through. Doom Patrol, the Justice League, and every other “awake” hero on Earth Prime now have an “all hands on deck” call to answer. They’re going to have to fight for their reality, or risk turning into the comic book version of Pleasantville. This #1 does its job. It establishes the stakes, sets the lineup, and gets the reader excited. Any small faults can be forgiven on those grounds. This event might be the one that gets DC fans to stop fearing events. If you’d told me five years ago that Gerard Way is going to be the person to save DC, I would not have believed it for a second. I was never really even a fan of My Chemical Romance, so the idea that their lead singer might take the reins on my favorite comic universe would have been unfathomable. But he did it, he took them, and he’s pulling it off magnificently. Milk Wars is going to be a fun ride. For any fan of DC, I consider it a must-read. Forget this whole Doomsday Clock nonsense, take a break from Dark Nights Metal, and pick up some of the Young Animals titles. You’ll regret missing out on this hurricane of insanity and milk.